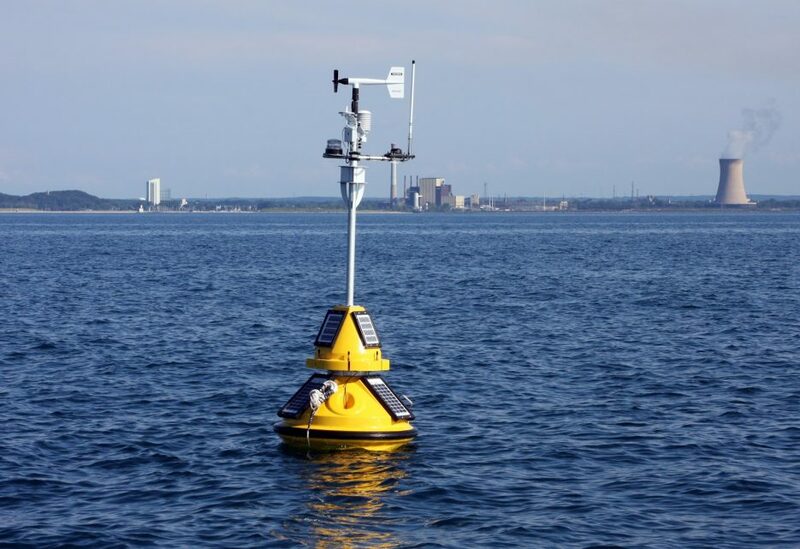 Swimmers, boaters, and anglers visiting Indiana’s coastline can once again learn about conditions in southern Lake Michigan with real-time data collected by the Michigan City buoy. The buoy, launched for the first time in 2012, returned to its post four miles from shore today to collect data on wave height and direction, wind speed, and air and surface water temperatures. The only one of its kind in the Indiana waters of the lake, the Michigan City buoy and its temperature chain helps anglers and boaters find fishing hot spots and identify the safest times to be out on the lake. Scientists at the National Weather Service in northern Indiana will also use wave height and frequency data collected throughout the season to better anticipate the locations of strong waves and currents that cause dangerous swimming conditions. Real-time data on nearshore temperatures and wave characteristics is also vital for research on fisheries and nearshore hydrodynamics. Data will be available on IISG’s website until the buoy is pulled out for the winter in mid-October. The site shows snapshots of lake conditions—updated every 10 minutes—as well as trends over 24-hour and 5-day periods. Buoy-watchers can also download raw historical data at NOAA’s National Data Buoy Center. And starting later this season, our website will also relay data collected by a new environmental sensing buoy placed north of Chicago. In addition to allowing people to track waves and temperatures, the data collected by this buoy could also help officials warn beachgoers when contamination levels may make swimming unsafe.